Padawans, Sith Lords, Jedi Knights, lend me your ears! We have a preview of the upcoming book Star Wars encyclopedia, The Jedi Path: A Manual for Students of the Force by Daniel Wallace. 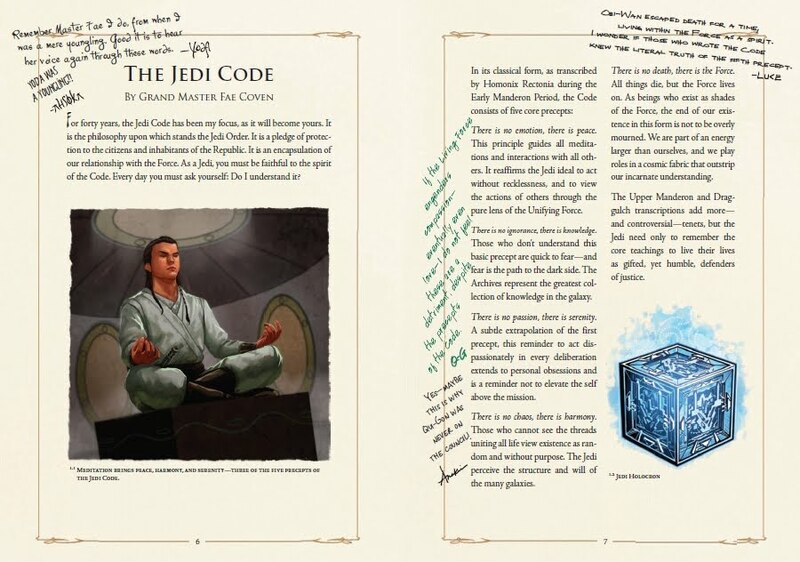 THE JEDI PATH: A MANUAL FOR STUDENTS OF THE FORCE is a handbook, created for students of the Force to help them on their path to becoming a Jedi Master, now that it has been rediscovered, balance in the Force, there will be. 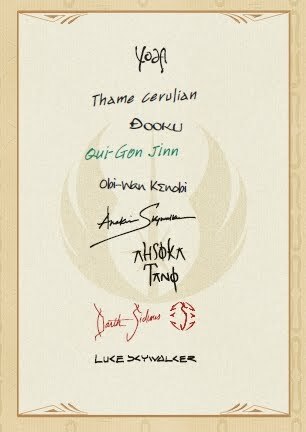 "A long time ago, in a galaxy far, far away… a group of ancient Jedi Masters painstakingly set out to define the roles and training practices within the Jedi Order. 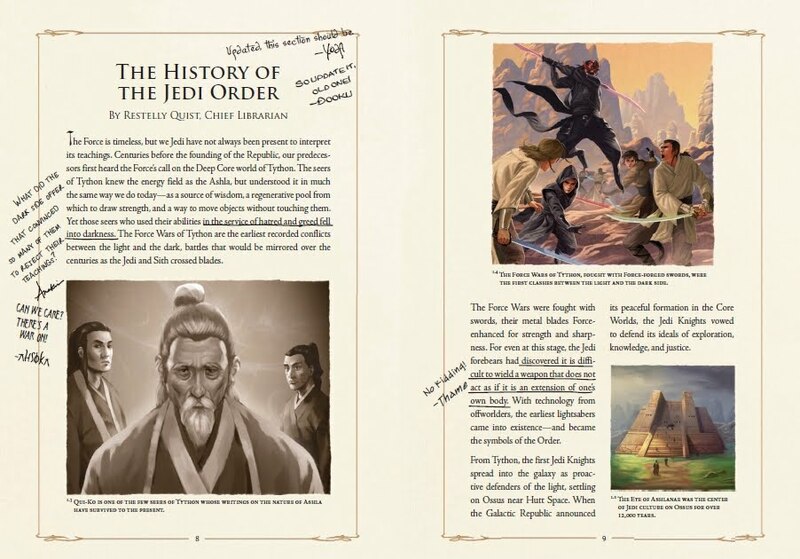 Just one copy of the venerable tome has survived throughout the centuries, passed from Jedi Masters to their Padawans—and annotated over the years by Yoda, Obi-Wan Kenobi, Anakin Skywalker, Count Dooku, and Luke Skywalker, among others." 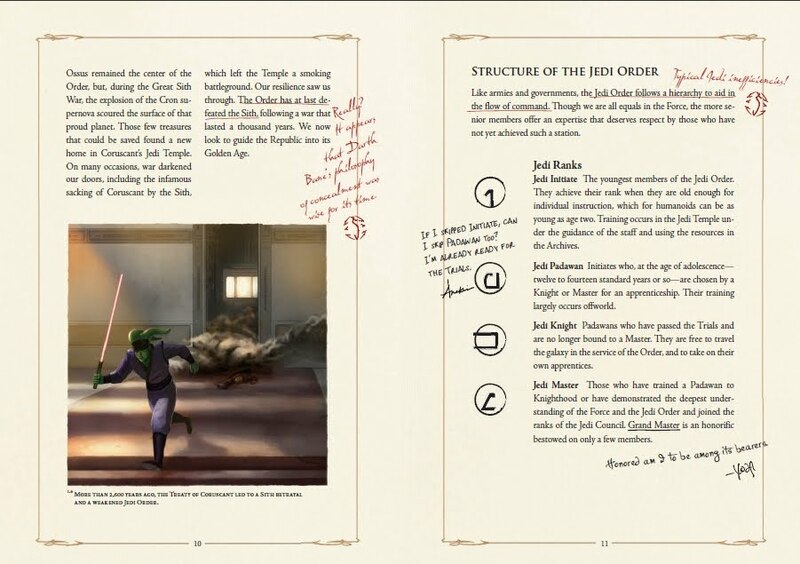 That’s the background story behind THE JEDI PATH, a training manual for Jedi and Star Wars fans alike in an incredible deluxe Special Edition produced by becker&mayer! in collaboration with Lucasfilm, New York Times bestselling author Daniel Wallace, and celebrated STAR WARS illustrators. Seriously, this thing looks amazing! I haven't seen any release details here in Australia but when it comes out, I want one! "This is the first time a STAR WARS book has been treated as an actual artifact that originated in the STAR WARS universe. This thousand-year old textbook bears the handwritten notes of everyone from Yoda to Luke Skywalker, and it contains souvenirs including Qui-Gon's Padawan braid and a napkin from Dex's Diner," says Carol Roeder, director of publishing for Lucasfilm Ltd. 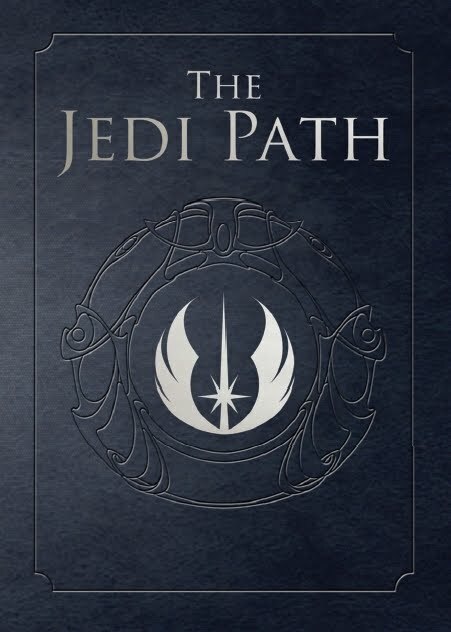 The Jedi Path Special Edition is enclosed in a metal case which opens to reveal a platform which raises up, holding the sacred text, with lights and sounds from the Star Wars universe. 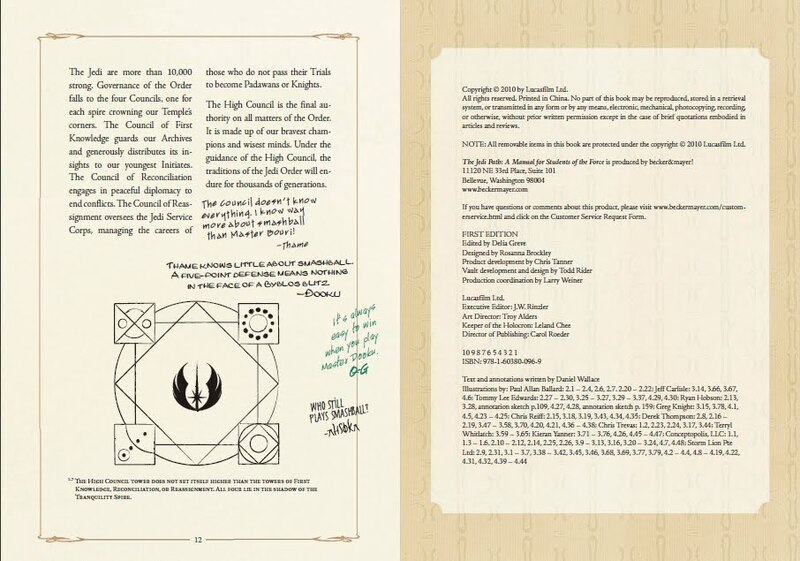 The 160-page manual has a faux-leather cover featuring embossing and foil stamping, as well as eight removable mementoes tucked within its pages—including Obi-Wan Kenobi’s sketch of his lightsaber (scribbled on a napkin from Dex’s Diner) and the Padawan braid of Qui-Gon Jinn, which was cut off during his Knighting ceremony. The book’s elegant design showcases more than 150 original illustrations by acclaimed STAR WARS artists including Tommy Lee Edwards, Chris Trevas, and Terryl Whitlatch. The Jedi Path draws from the history of the Star Wars universe while introducing some brand new never-before seen characters. Fans can also watch a short video about THE JEDI PATH on www.Starwars.com and www.amazon.com, where they may also pre-order the Special Edition (man I should get a kick back for this!). In the US this incredible collectors item will be available at most major retailers from September 28th. Fingers crossed for a release here in Australia soon after. Hi Ryan -- I'm the writer of the Jedi Path, and thanks for the great post! I know that Amazon is offering the book on its US, UK, France, Germany, and Japan sites and that it will be at select retailers. What that means for Australia I'm not sure yet. Certainly international shipping is an option from one of the 5 Amazon sites but cost implications will vary.